Check out the screen here. It's nice to become part of your community! I'd love to share our project with you, which we are working on for 11 months now. It's an Audio Adventure Game (AAG) with audio only - no graphics. But that doesn't mean it's a game for visually impaired people. The Girl Who Sold the World is a true adventure providing a complete gaming experience. In TGWSTW you are pulled into the story by a great canvas of sound. You find yourself in the middle of the adventure, helping Frances to survive, to find her way through a strange world, to find out the truth who she is, where she is and what it’s all about. All you have to do is to put on your headphones, dive into the fictive world and let your mental cinema do the rest! The cool thing about audio is that although the story is the same for everyone each of us will build his own world, his own characters. The gaming experience is going to be unique for every player! It’s kind of like we were playing Manic Mansion and we had to use our imagination to put together those big pixels into beautiful pictures in our heads! But with audio only you are free to let your imagination run wild! I know for some of you, it may sound scary that there are no graphics at all. But believe me, your imagination has more power than you think. Just turn off the sound while watching one of your favorite movies and no matter how great the pictures are your perception gets confused and it feels just not right. But if you make it the other way and just close your eyes you can still imagine the pictures when supported by sound and have a great experience. Of course, an intriguing story is key to a thrilling experience and I think we have it with TGWSTW. I would really appreciate it to have some specialists/true adventure fans from this community as game testers on board. So if I aroused your interest you are more than welcome to apply as a game tester on our website. I appreciate any feedback and comments. It helps so much through that hard times of development. THANK YOU. Last edited by TimeCatcher; 02/20/17 12:51 PM. May I ask what "action sequences" there are? make up the biggest part. I am picturing a text adventure with audio clues. Interesting concept! This sounds fascinating. Hope development goes well! @BrownEyedTigre Thank you, Ana! Happy to hear that there's some interest. We just published teaser #1 for TGWSTW showing a small part of the gameplay specifically a few inputs, choices and one failed time pressure choice. There may be up to 4 options you can choose from and thus push the story into a specific direction. 1. The "DO LIST" (gear icon) where you can decide what to do or explore next by picking a task from a range of possibilities. the Lifeline games but with added audio. in ios format. Love them. with the girl who sold the world. @mignonne Thank you for your post! Yeah, there might be similarities although I didn't play Lifeline unfortunately. What we have in common with Lifeline is the real-time company of the character. So there will be times when you have to disconnect and wait for Frances to overcome this and that. reason, you are receiving communications from this person. a different course of action. possibly items are found to use in solving problems. Basically, they are text adventures. But have some replayability. inspired your choice of title??? @mignonne Thank you so much for the explanation. and makes no sense at all in the beginning because it could mean everything. and some very hard decisions which need to be made, the truth will reveal. EDIT: P.S. You have much experience from playing all these games. 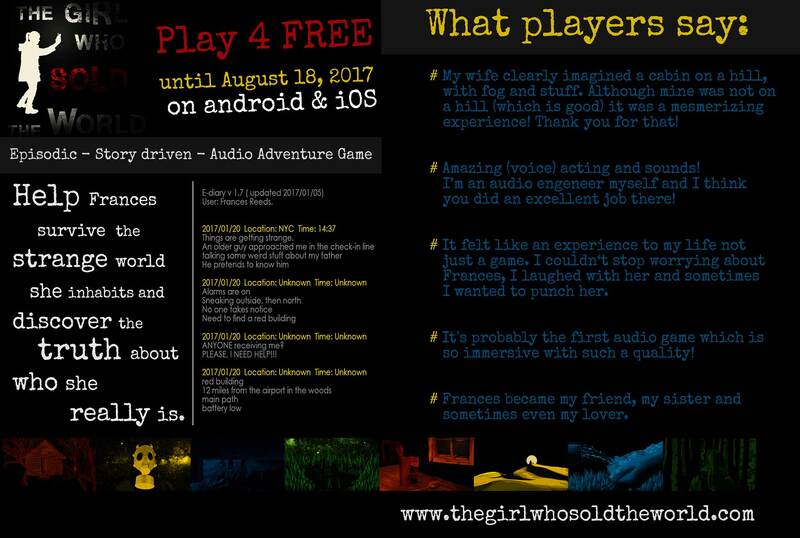 I think you should apply as a game tester for TGWSTW! Thus you'll get the game for free, plus you'd help us with your precious opinion. I'd really appreciate it. Last edited by TimeCatcher; 02/21/17 06:01 AM. It was a rocky road but we finally did it. We’re happy and proud to announce that chapter 1 will be available on AppStore and Google Play on August 15. Thanks, everyone! Here's a little give away so you can check the first chapter out. Have fun!